So, here we are a couple of days before the election and it looks very much like the current government is going to get a drubbing the like of which we haven't seen since, emmm, well, since the last election. The latest MRBI poll has Fine Gael down at 28% and Labour in the basement with six percent of the popular vote. The two parties seem set to get a stark message from an electorate pissed off at unrealistic broken promises made in 2011, an anger they foolishly hoped to assuage by making new irresponsible promises in 2016. In short they are trying to sell the same bonham in a poke they sold the last time out, thus neatly undermining their own credibility and their ability to impugn the credibility of a set of opposition parties selling equally unrealistic promises. There is, of course, more to it than that: a component of the meltdown is the singular lack of charisma of the leaders of both government parties combined with a media establishment that, while almost universally hostile to one of the government's opponents, Sinn Féin, seems, in RTÉ's case, sympathetic to, and in Independent News and Media's case, almost bought and paid for by a Fianna Fáil that now looks — weirdly — poised to retake up to half the ground it lost in their richly deserved trouncing in 2011. Why should it be thought weird though that the largest opposition party in the country should profit from the discombobulation of a government that has simply made a mess of its reelection strategy? Well, the first thing is that they are offering effectively nothing different to the two government parties. Even their opposition to water charges is both half-hearted and lacking in credibility. Water charges were their idea in the first place and their promise is limited to suspending charges for a few years. They are essentially selling themselves as a new safe pair of hands after the five years of government mishandling. And that you'll realise if you are reading attentively, is where things get really weird. 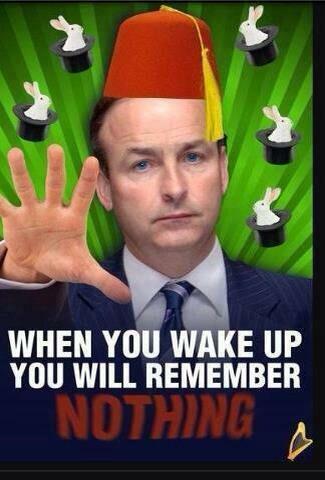 Yes indeed, Fianna Fáil are selling themselves as new safe pair of hands in which to put the economy! Seriously! One of the great ironies of this campaign so far is that the expression "brass neck" has been used more frequently by the leader of Fianna Fáil than any other politician in the public eye. Because his essential case is based on pointing at the government for situations that they were handed by his own party in 2011. Take the homeless issue, for example: While the government did indeed have five years to deal with the problem, and have only recently been getting a handle on it, and ought to be criticised strongly for their delay, it should be realised (and this is never mentioned on any medium whatsoever) that almost every single family now living in emergency accommodation is there because of mortgages entered into before the 2008 Fianna Fáil generated crash and that went bad due to that Fianna Fáil generated crash. In short, Fianna Fáil largely caused the homeless crisis that thy are blaming the present government for. And Michéal of the brass neck does indeed wax passionate about homeless. He's not stupid. He knows whose fault the homeless crisis ultimately is. He simply doesn't care. Whatever suits his party. He also knows that political commentators don't like the often well justified claim made by Fine Gael and Labour that the government's principal problems can all be traced back to Fianna Fáil past mismanagement. They're not too fond of that view, partially because that is an obvious truth that doesn't provide much room for complex political commentary and partially because Fianna Fáil sympathisers seem are heavily overrepresented in the Irish political pundit class. Indeed almost as soon as the 2011 election was over, several of RTÉ's favourite pundits were talking about how much of the victors' success was down to excoriating the Fianna Fáil-led government that preceded them and that sooner or later they would have to provide some other discourse. I remember thinking at the time that the kindest possible interpretation of such comments was that they were engaging in creating a self-fulfilling prophesy. A more cynical interpretation would be that some of them at least were marking the new government's cards in bold print. Then there came the fatal government miscalculation of setting up the Dáil's own banking inquiry and then immediately destroying its credibility by cackhandedly being caught ensuring that it had a government majority in the hope that they could get something like an official declaration that it was all Fianna Fáil's fault. The project was doomed from the start, because it was inevitably either going to have to reach a compromise with its Fianna Fáil members or have them walk out on it as a set-up. Not only was the project doomed, it was also unnecessary: blame for the disaster was a political matter, and blame had already been allocated by the electorate without any need to have quasi-judicial confirmation from the houses of the Oireachtas. So, perhaps naively, the present government has not put much emphasis during this campaign on the twin truths that homelessness, reduced public service pay, an employment situation that has still not completely recovered and much much more was almost exclusively the fault of the previous government and that it was unreasonable to expect a government to cure a broken Ireland in the course of just one term in government. Enda is shouting it now on every platform available to him, but his new dependency on this simple discourse is seen for what it is: an act of desperation. It's just too late. The result is that Fianna Fáil now look set to paint themselves as the winners of Friday's election over the weekend. They intend to use it as a springboard for their recovery and eventual return to the position of default party of power in the country. If the electorate does decide to allow them to take that first step towards recovery, it'll be a missed opportunity. Because voters now have the opportunity of removing the larger of a brace thick old dying trees in the Irish landscape whose historical dominance of the political scene prevents them from getting a clear view of the woods. To fail to take that opportunity would be a tragedy. To those who can't stomach the idea of voting for a government party I have a plea: vote for anyone — literally anyone — other than your local Fianna Fáil candidate. You kicked them out last time. It would be a big mistake to leave the door open for them to come in again.